"You have to go out. You don’t have to come back." Two years ago I did a series of posts about the Unite States Life-Saving Service. 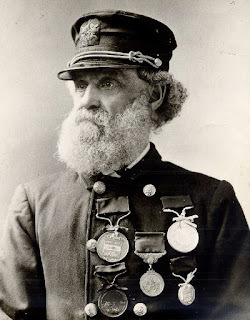 (If you want to brush up on what exactly the Life-Saving Service was and how they went about rescuing people from wrecked ships, here's a link to some of my old posts). "You have to go out. You don’t have to come back." This was the unofficial motto of the U.S Life-Saving Service, a precursor to the United States Coast Guard. Back before helicopters and radar and power boats, life-saving teams braved stormy waters with little more than rowboats, storm suits, and life rings. the most decorated and most well known. His name is Joshua James, and he lived in Massachusetts. 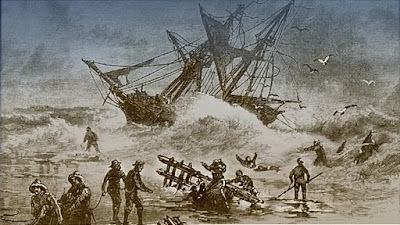 At the age of ten, James watched his mother and baby sister die when the ship they were sailing on got caught in a storm and wrecked a half mile from the harbor. When he was fifteen, James joined a group of volunteers from the local humane society was the launched a surfboat to go rescue passengers from a floundering ship named Mohawk. That was Jame's first life-saving rescue, but he went on to spend the next sixty years of his life rescuing sailors. First, he worked as a volunteer life-saver for the Massachusetts Humane Society, and then he worked as a station keeper for the U.S. Life-Saving Service. He's credited with saving over 200 lives, and was awarded the Gold Lifesaving Medal from the life-saving service as well as several other medals from the Massachusetts Humane Society. James died at the age of 75, after returning from running a life-saving drill in stormy weather. He apparently paddled for over an hour with the other men of his crew while they tested a new surfboat. Upon returning to the beach, he died of a heart attack. I modeled the hero in my newest Eagle Harbor novel after Joshua James. My fictional Elijah Cummings grew up in Eagle Harbor, Michigan, on the shores of Lake Superior. He spent two years sailing the Atlantic Ocean and saw life-saving teams in action. After his father drowns in a storm, Elijah returns to Eagle Harbor. Unable to sit by and watch when ships flounder coming into port, he starts a volunteer life-saving team. But the icy conditions and strong storms prove difficult for his volunteers and secondhand equipment. He soon finds himself fighting for the U.S. Life-Saving Service to establish a legitimate station—as well as fighting for the woman he’s loved for fifteen years. Giveaway: Answer one of the questions below to be eligible for a paperback copy of either Love's Unfading Light or Love's Every Whisper. Winner's choice. Question: Do you enjoy novels where the characters have unusual jobs and hobbies? Do you personally know anyone with a dangerous job that puts their life at risk? How do family members respond when a person they love has a risky job? Victoria Donnelly simply wants to do something right, at least once in her lifetime. 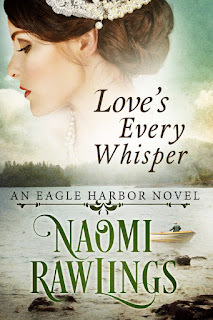 With five years of failed courtships behind her and the calendar inching closer to another birthday, she's determined to redeem herself and snag a proposal from a wealthy childhood acquaintance, Gilbert Sinclair. But returning to Eagle Harbor stirs up long forgotten memories. And worse, old affection for her betrothed's enemy. Elijah Cummings has loved Victoria for fifteen years. But fishermen's sons don't marry shipping barons' daughters. He knows it. She knows it. The entire town knows it. Resolved to keep his distance from Victoria, Elijah focuses on establishing a much needed life-saving station, risking his own life by rescuing sailors stuck aboard shipwrecks. I do enjoy novels where the characters have a different job. The world is not made entirely of secretaries and lawyers! I do know some firefighters, policemen and women and EMT's. Today can't be taken for granted by anyone; these people just have a better awareness of this than most of us. I'm with you, Connie. I like it when characters have a different job--especially one I find fascinating. A telephone operator for the hero, not so much. But an Indian agent for the hero, now there's a book I'd pick up in a heartbeat. Same for a life-saver. I love reading and learning about unusual occupations. I personally know several volunteer fiiremen and I admire them tremendously. They risk their lives to serve our community and receive no pay. Me too, Connie! Our community has a volunteer fire squad, and I'm very thankful for them. There a lot of unsung hero's out there. I love the unique story lines where characters have different than normal jobs. It keeps my interest! I think I'd be the same way, Loraine. Torn between love and worry. Yes, I do enjoy reading books in which the characters have unusual occupations. My nephew is a Chaplain in the Army - he is stationed in the states now, but has been stationed in Afghanistan and other places where he served the men on the front lines of attack. I think there is always some element of worry when a loved one is involved in an occupation of great danger, however, there is also peace for each person who follows God's plan for his/her life, believes God is in control and works everything to his/her good. Thanks for the interesting post, Naomi, and the giveaway opportunity - I'd love to read both of your books!! Hey Bonnie, I think that's exactly it! Everything boils down to God's peace when a loved one is in a dangerous situation. It is fun to read novels where the characters have different or unusual jobs! There are some jobs out there that you never even think about, but someone has to do them. The firefighters who deal with wild fires strike me as having both dangerous and unusual jobs. It's refreshing reading about something new and different, and characters who risk their lives for others are particularly interesting. It takes great strength of character to take responsibility for someone else's life while at the same time risking their own lives. This makes for exciting and very interesting reading. Many of my favorite books are based right here in Michigan. Lake Superior is as deadly as any ocean when the storms roll in. Thank you for sharing this interesting article and offering a giveaway of your book! You're welcome, Nancee. I really enjoy reading stories set in MI too! Yes, I enjoy novels where characters have unusual jobs or hobbies. It makes for exciting reading. I have friends who are in law enforcement and a son-in-law who is a Military Policeman in the Army. Our attitude (friends and family) is that we are not guaranteed to live another day. A well-trained law enforcement officer or military police officer can take measures to protect themselves. Families make an effort to enjoy each day and make sure the tell each other I love you. My son-in-law and family find some activity to do together on his days off. 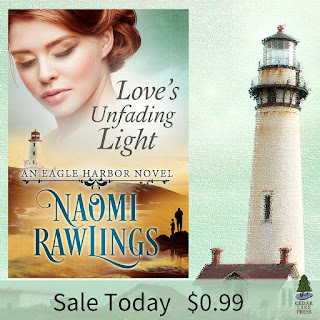 I loved reading Love's Every Whisper and I am ordering Love's Unfading Light.